So what exactly is a "lingering flavor"? Is it the unmistakable result of eating too much chili? Wait, that's a "lingering odor". Alright, let's try again. Is it the burning sensation in your mouth after eating suicide wings? Well, I certainly hope not. I guess it could possibly be the essence of The Cannery's lobster oil or the strong earthiness of Blue Water's truffle fries. Ah yes, those are certainly desirable lingering tastes. Now if a restaurant dares call itself "Lingering Flavor", it really needs to live up to it. Furthermore, it'd better be a darn good flavor since there would be no repeat customers if it wasn't. This modest bubble tea and Taiwanese hole-in-the wall resides right next to London Drugs near Kingsway and Joyce. I've been eying this place for awhile and finally had the chance to pay it a visit with Costanza. He'd already had eaten lunch; but I dragged him along for some company. I actually was over at his house to help him with some of the renovations. So from now on, I'd help him with one condition - eat out with me after every visit! LOL... I'm now resorting to coercing my friends to eat with me! Since he wasn't hungry, he decided on a bubble tea with mini-pearl s. On a side note, I must say that the Lingering Flavor "mascot" is a bit troubling. Resembling Pacman whose a bit too excited seeing Mrs. Pacman in lingerie, it just doesn't look right. If I were them, I'd get my money back from the graphics designer. Now the bubble tea itself was incredibly sweet while the mini-pearls were cute; but a bit too chewy. As for my Spicy Beef Noodle, it was decent. The soup base was indeed spicy; yet lacked the richness you'd expect from a beef noodle. The meat could've been a bit more tender as well. But it was cheap and fast, I have no big complaints. 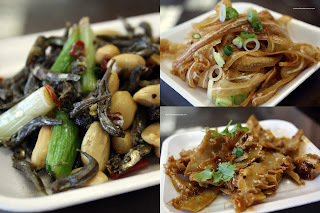 I decided to do a few side dishes as well: Marinated Pig's Ear, Tripe and Chili Dried Fish with Peanuts. The texture of the pig's ear and tripe were soft while being chewy as the same time. There was a good amount of flavour as well. The dried fish was only passable. It's possible that their version is different than what I personally like, which is a slightly sweeter taste. It was mostly just spicy. Add that to the spicy beef noodle and the taste really did indeed linger. "I must say that the Lingering Flavor "mascot" is a bit troubling..."
Wow, and I thought the Tiger Woods jokes were bad! What is the minced yellow stuff in the middle of the beef noodle bowl? Ginger? The yellow stuff is pickled mustard greens. Adds a nice zing to the broth & noodles. how much was the bowl of noodles and the bubble tea? I believe the noodles were like $6 and the tea was $3.50. Every time I past this place, there is a lingering smell.